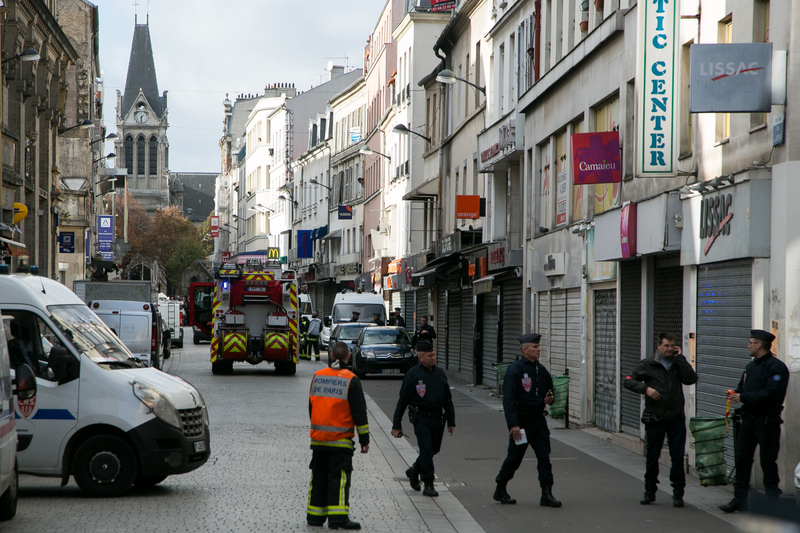 Early Wednesday morning, French police raided the suburb of Saint-Denis for multiple major suspects involved in the Paris attacks, resulting in three deaths. A female suspect died after detonating her suicide vest while another man, who Al Jazeera reported was another suspect, also died in the raid. The third death was, tragically, a crucial member of the French anti-terrorism unit known as RAID (Recherche, Assistance, Intervention, Dissuasion). Diesel the police dog died in the raid when she was sent into the building first to search for explosives. Since her death was confirmed, many have taken to Twitter to pay tribute to the canine hero with the line "RIP Diesel," who gave her life to protect her human partners. At around 4:30 a.m. Wednesday morning, police closed in on an apartment building in Saint-Denis where they believed Abdelhamid Abaaoud, the suspected mastermind behind the Nov. 13 Paris attacks; suspect Salah Abdeslam; and a possible ninth attacker could be hiding. After a female suicide bomber detonated her vest during the hours-long standoff, police ended the raid with seven arrests, but did not confirm whether they included the three targets. Fortunately, no officers were killed and five sustained only minor injuries, and that's partially due to the actions of Diesel, RAID's assault and explosives search dog. On Wednesday, France's Police Nationale confirmed Diesel's death on Twitter, reporting that the 7-year-old Belgian Shepherd dog "was killed by terrorists in the current operation in Saint-Denis." Now countless supporters are honoring Diesel on Twitter using the hashtags #JeSuisChien, #NotAllHeroesAreHuman, and #RIPDiesel. While the outpouring of support is strong and heartfelt, there are others on social media who are calling out the frivolity of focusing so much attention on a dog when the world is essentially at war with a ruthless terror organization. However, there will always be pressing concerns to turn our attention to, but if mourners want to take a minute to honor the brave canine, their gesture shouldn't be undermined. It's also important to remember that these police dogs are integral members of the force. Police Nationale called these assault and explosives search dogs "indispensable," and that's for good reason. According to a 2010 Wired report, bomb detector squads were only able to find about 50 percent of the improvised explosives in Iraq and Afghanistan, but that percentage jumped to 80 when they brought bomb-sniffing dogs with them. Not only can these dogs sniff out 19,000 different combinations of explosives, but they are also completely fearless and loyal members of the team. That certainly warrants a tribute.